Opening hours: Shops are generally open from 9am-5pm on weekdays and Saturdays. In tourist areas shops and larger malls usually stay open until 8pm. On Sundays shops are open at their own discretion. Banks are open from 9am-3/4pm. In the city some banks stay open a few hours on Saturdays as well. Twenty blocks long, this one-mile boardwalk along the oceanfront is called Malecon. It is truly picturesque and a “must-walk” so make sure to bring your camera. 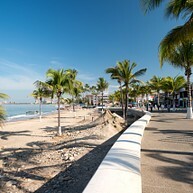 Stroll along the water among cafés, shops, and the beautiful signature Puerto Vallarta sculptures. Bay of Banderas has approximately a 60 kilometers long coastline filled with beautiful beaches and activities. The bay starts off in the north with Punta de Mita and ends on the south side at Cabo Corrientes. 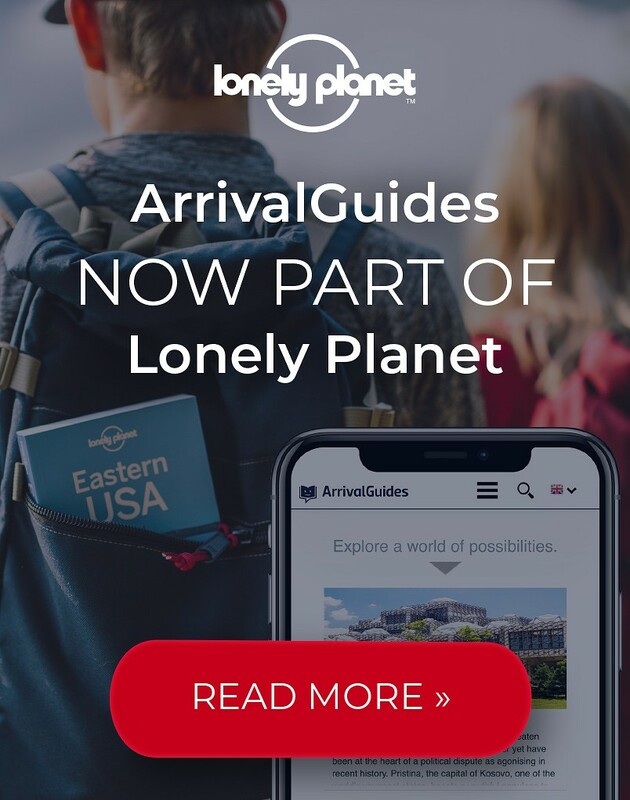 You will definitely not have a problem finding your favorite spot here since there are so many great places to choose from. Claimed to be one of Puerto Vallarta’s main tourist attractions, the Aquaventuras Park offers a day full of action. 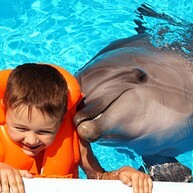 Here you can find animals, water slides, dolphins, playgrounds and much more. They are even allowing you to interact with the dolphins, petting, swimming and dancing with them. For the kids, there are "The Little Water World - Children's Area" and "Lazy River" and plenty of shows to attend. 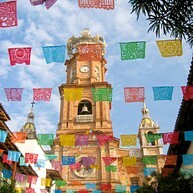 When in Puerto Vallarta you will certainly come across the so-called Zona Romantica the Old Town. 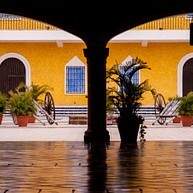 In this popular neighborhood, you will be able to experience what Mexico is all about; charm, food, and lovely people. Make sure you do not miss the gorgeous sunset. 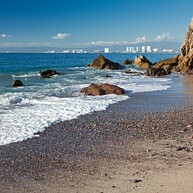 This secluded beach area is one of Puerto Vallarta’s most popular hideaways. You will find Las Caletas on the southern shores of Bay of Banderas and it can only be reached by boat. Here you can enjoy different activities like snorkeling and kayaking. If you feel like exploring your cultural side, you can visit Teatro Vallarta which is housed in a modern building and has a seat capacity of 900. Here you can sit down in a comfortable seat and just relax while watching one of the quality shows like ballet, theater, or opera. The theater draws performers from all over Mexico and abroad, so check the calendar what is going on. Every year several fishermen are drawn to Puerto Vallarta for the Sailfish & Marlin International Tournament. Join in yourself or watch the hunt for catching the big fish. At this tournament you will for sure find some great fish and make some new friends. Check the date on the site below. 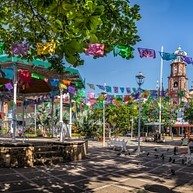 Plaza Principal, also called El Jardin Principal, is the main square of Puerto Vallarta. This place is a wonderful oasis in the center of the city and often hosts events and concerts. Also, great place where to just sit down and watch people strolling by. The arty Old Town in Puerto Vallarta is full of beautiful cobbled streets. Here you can wander among cafés, vendors and knick-knacks in the daytime and go to one of the many bars and restaurants in the evening. 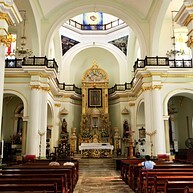 Our Lady of Guadalupe Church stands proudly as the main focal point on Puerto Vallarta’s skyline. This is one of the city’s most beautiful landmarks and well worth a visit due to its historical and spiritual ambiance. Step inside and take your time to explore the interior inside, the stained glass, statues and the religious artifacts are all on display. 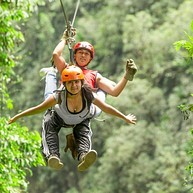 Puerto Vallarta is located near The Sierra Madre Mountains, which offer a wide range of adventurous activities. Explore an area full of waterfalls, canyons, snow-covered mountains and tropical forests with the experienced staff from Vallarta Adventures. If you want to get an adrenaline rush, then do the zip-lining and fly like a bird through the rainforest while enjoying the amazing scenery. Located close to the mainland, the Marietas Islands are definitely worth a visit if you like scuba diving. You can go here by boat to explore the wonderful reefs and exotic fish, turtles and dolphins. 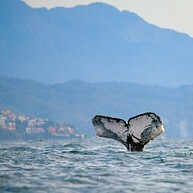 During winter months, you can even see humpback whales in the bay. 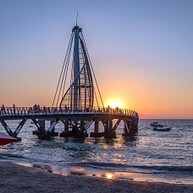 Whether you are looking for an outdoor adventure like a waterslide or a thrill up the mountains, you are sure to find it in and around Puerto Vallarta. This is the ultimate area for trying something completely different like thrilling zip lines, swimming with dolphins, whale watching or sea safari. Like most places in Mexico, the Los Muertos Pier is colorful and full of fun. This romantic pier teems with people and will take your breath away both day and night. In the evenings, the pier lights up and changes colors throughout the night, making it a beautiful sight to look at. If you want to visit one of Puerto Vallarta’s most romantic spots, you should go to El Faro Lighthouse. In the top of the lighthouse there is a bar, perfect for having cocktails while watching the beautiful sunset.